Hostinger was founded in 2004. It allows you create a website for FREE. There are many plans like Shared hosting, VPS Hosting, Cloud Hosting, Website Builder and many more. Currently it provide services to more than 29 million users. Here you can get Hostinger free coupons. You can also visit below mentioned links for getting offers related to Hostinger country wise. Avail 90% plus additional 15% off on Hostinger India Plans. Plan starts from just Rs.45/month only. Get 74% plus additional 15% off on cloud startup hosting plan. Plan starts from just $7.45/month when you buy for 48 months. It includes Lifetime SSL certificate, Cloudflare Protection and Daily Backups included for FREE! Having certain features like includes Dedicated IP Address, 40 GB Disk Space, Unlimited Bandwidth, 3 GB RAM, 2 CPU Cores. Avail 74% plus additional 15% discount on hostinger cloud professional hosting. Plan starts from $14.95/month when you buy for 4 year plan. Plan feature includes like Dedicated IP Address, 80 GB Disk Space, Unlimited Bandwidth, 6 GB RAM and 4 CPU Cores. Get 79% Off plus additional 15% off on hostinger cloud enterprise hosting. Plan includes Dedicated IP Address, 160 GB Disk Space, Unlimited Bandwidth, 12 GB RAM and 6 CPU Cores. After discount price is $27.45/month. Get Lifetime SSL certificate at the cost of only $11.95. Use Hostinger SSL Coupon Code provided here to get discount. You can get flat 50% off. Get 90% plus extra 15% off on shared hosting plans. Avail 82% +15% discount on premium shared hosting.Price starts from $2.15/month only. You will get 30 days money back guarantee. You can cancel anytime. Get 78% plus additional 15% off on Hostinger business shared hosting when you buy 4 year plan. Use Special coupon code provided here to get discount. Plan starts from just 3.45/month. Build your website in just minutes with Hostinger website builder. It is very simple four step process. Signup, choose template, customize website and publish. 77% + 15% off on Hostinger vps hosting plans when you buy 8 GB plan. Minimum discount 56%. Plan starts from $3.95/month only. 1 GB VPS plan includes 1 GB Memory, 2.4 GHZ CPU power, 20 GB storage, 1000 GB bandwidth and 3513 GEEKBENCH Score. VPS hosting comes with Dedicated IP, full root access, SSD disk drives and 100 MB/S network. Save 79% plus additional 15% off on Hostinger cloud hosting. Hostinger Cloud startup plan starts from $7.45/month which includes Dedicated IP Address,40 GB Disk Space, Unlimited Bandwidth, 3 GB RAM and 2 CPU Cores. 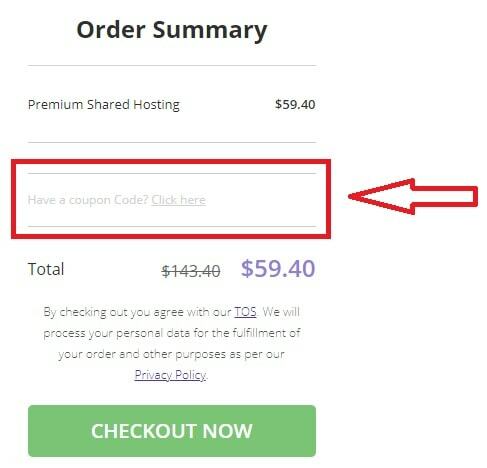 How to Redeem Hostinger Coupon Code? Step 1 : To redeem hostinger coupon code first visit Hostinger.com. Step 2: Select Plans as mentioned below. You can select plans from 3 months to 48 months. Step 3: Now on the right hand side you will see the order summary. In the summary add coupon code copied from this page. That’s it. You will avail the discount. Video Guide on How to Redeem Hostinger Promo Code? Here you can check the video on how to redeem Hostinger promo code. I have tried to make it very simple to understand. You can follow the same step in order to avail discount. Does hostinger provide promo code on domain names? Answer to this question is that right now no active coupon for hostinger domain. But you can get discount on domain name for the first year. You will avail 18% discount on hostinger domain registration. Another way to get free domain name is to buy Premium or Business hosting plan for 12 months or longer duration. 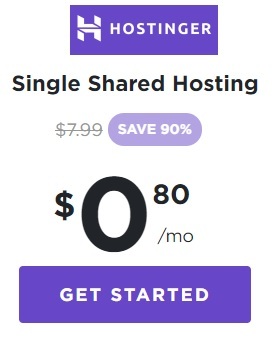 Hostinger allows you to host your website free of cost. You can host your own website, build new website using WordPress or using available templates. It very much easy. It allows 1 click installation for WordPress. Visit here to host Website free of cost using Hostinger Free Hosting. Here you can choose from various hosting plans like Single Shared hosting, Premium Shared Hosting and Business Shared Hosting. Basic Shared hosting plan starts from just $1.45/month. Additionally when you apply coupon code provided by us then you can get that at just $1.23/month. Basic Plan is good for those whose website having less number of visitors or we can say low traffic. Plan includes 1 Website, 1 Email Account, 100 GB Bandwidth and 1X Processing Power & Memory. This type of hosting includes Unlimited Number of Websites, Unlimited Email Accounts, Unlimited Bandwidth, 2X Processing Power & Memory and it takes up Weekly Backups of your website which makes your important data safe. Plan starts from just $2.95/month when you buy for 48 months. Use our special 15% off coupon code ad get it at just $2.51/month. This plan includes all the features of premium shared hosting plus additional features like Daily Backups, Free SSL Certificate and 4X Processing Power & Memory. Business hosting plan starts from $3.95/month. And after applying Hostinger coupon it will be $3.36/month. You can get Hostinger Promo Code India for India users and users from united kingdom (UK) can use Special Hostinger UK Promo Code here.